All products reviewed on this site that cost between $100 and $200. The Zojirushi 586361-CV-DCC40XT VE Hybrid Water Boiler And Warmer, to give this product its full name, is the replacement product for the incredibly successful CV-DSC40 VE. The Zojirushi 586361-CV-DCC40XT VE Hybrid Water Boiler And Warmer, to give this product its full name, is the replacement product for the incredibly successful CV-DSC40 VE. You can read our review of the CV-DSC40 by clicking here (opens in a new tab). Both of these products give you the convenience of instant hot water of a pre-determined temperature at the touch of a button. Invaluable if you enjoy drinking specialist teas, and extremely useful if you are a regular coffee drinker. So why did Zojirushi decide to produce a replacement for their original water boiler and warmer? What Distinguishes The Zojirushi CV-DCC40XT From The CV-DSC40? This products predecessor, the Zojirushi CV-DSC40, was incredibly popular. It still is if you can get hold of one. However, there was one thing about it, in common with nearly every other water boiler on the market, that many reviewers disliked. And Zojirushi listened. In order to produce water at a set temperature, the CV-DSC40 always boils it first. That in itself doesn't take long. But it does take a while for the water to cool down to the set temperature. If that was set at anything less than the maximum of 208 degrees then it could be quite a long time. The Zojirushi CV-DCC40XT overcomes that problem. Its Quick Temp mode enables it to heat up water to the desired temperature without boiling it first. This can save an incredible 6 hours if you're heating water to 160 degrees, for example to make some delicate Japanese tea. Even if you're heating it to 195 degrees you'll save up to an impressive one and a half hours (depending on the ambient temperature). This setting also saves energy consumption (and therefore money as well) and cuts down on the emission of steam. There are circumstances where you may want to boil your water before consuming it. These include where you are feeding a baby or where de-chlorination of the water is necessary. Even here you can still use Quick Temp if your water is bottled or purified. Just one other thing to mention here. The CV-DCC40XT is available in capacities of 4 liters and 5 liters. 4 liters is ample for most users, but if you anticipate heavy usage, eg in an office, then the larger size is for you. Is It Really So Much Better Than A Kettle? The point about a water boiler and warmer like the Zojirushi CV-DCC40XT is that you have a supply of water of a pre-determined temperature on demand. And there is a digital readout showing the actual temperature of the water available in real time. A kettle can't do that. All it does is heat water up until it's boiled, unless you switch it off beforehand, but if you do that you can't know what the temperature is. The DCC40XT's pre-set temperature options reflect the demands of tea and coffee drinkers. Tea drinkers will probably outnumber coffee drinkers in using this product to its full potential, but there's a strong argument for saying that everyone needs a water boiler and warmer in their kitchen. The temperature options themselves are 160, 175, 195 and 208 degrees (and there is a straight boil setting). 160 is for high quality, delicate green teas, 175 is for various green teas, such as bancha, houjicha, or genmaicha, 195 is for oolong tea and white teas. Coffee drinkers will invariably use the 208 setting, also suitable for black, herbal and pu-erh tea and instant noodles. This latter setting can reduce energy consumption by up to 28% compared to boiling water and then letting it cool to 208. Even the power cord is made so as to detach from the body very easily - rather that than risk you catching or tripping over it and sending the machine, hot water and all, flying. Auto-shutoff kicks in with the "HH" setting if there's any danger of accidental damage, eg through the water level being too low. The Zojirushi CV-DCC40XT really is so much more than just a kettle. What Exactly Is A "Hybrid" Water Boiler and Dispenser? It's easy to be blinded by science when reading the manufacturer's description of this product. Let's just take a minute to go over what the various terms mean. The "VE" in the full title of the CV-DSS40XT refers to "Vacuum-Electric". This is the "vacuum insulation technology", another term that, together with "hybrid keep warm system" and "Vacuum Insulated Non-Electric Keep Warm", will mean very little to most people. It's quite simple - they all refer to using both electricity and vacuum insulation to heat the water and then keep it warm for extensive periods. Zojirushi have used a stainless steel double insulation wall, including a layer of vacuum insulation, to keep the water hot with very little power consumption. In itself it's no more complicated than the technology behind a vacuum flask. The practical benefits are that this product can rapidly heat water to a pre-determined temperature with precision, and keep it at that temperature for as long as you want. Without relying completely on electricity, and all at the touch of a button. It's all very well having water at a constant temperature any time you want it, but how long does it take to get there? That's assuming you don't want to spend money keeping your water warm all night as well as all day. After all, any water boiler and warmer has to heat the water to above the desired temperature and allow it to cool. This is in order to ensure that all the water in the tank is heated to the same temperature. The answer to that little problem is in the "Energy Saving Timer Function". This is a setting whereby you can shut off power to the heater, for example overnight, and have it come on again. This timer can be set for every hour between 6 and 10 hours from the time you set it. So you can set it before you retire for the night, and have it come on an hour or so before you rise. Your water will be at the required temperature as soon as you're ready for your morning brew. How Often Do I Have To Clean and Maintain It? As with any technological product, it's important to fully read and understand the User's Manual (downloadable from the manufacturer's site or from Amazon). This can save you no end of time and frustration by avoiding problems later on. The Zojirushi CV-DCC40XT is very easy to clean. It has a clear-coated stainless steel body which just wipes clean with a damp cloth. The inside of the water tank is of a non-stick coating made of PTFE, which is a fluoropolymer, a material commonly used for nonstick coating in cookware for conventional kitchen use. It will need a clean every couple of months or so, depending on usage. You do this by simply putting a couple of tablespoons of citric acid in the full tank of water and boiling it. There is a very high level of satisfaction with this product among reviewers. On Amazon.com nearly 500 reviewers have awarded an average of over 4.5 stars, as at the time of writing (March 2019). Especially popular is the Quick Temp setting that allows the unit to heat your water up to the desired temperature and then stop. Another feature that saves energy and is very popular is the vacuum layer, which means that the product uses less energy keeping your water warm. Durability, convenience and the ability to choose between different temperatures plus boil are other factors that have led to this high rating. Some reviewers have complained about worn down Teflon or other deposits forming on the bottom of their water boiler. It's not Teflon (which is stable up to around 600 F - far above the temperature to which the DCC40XT can heat) or anything else harmful, but simply mineral deposits from the water. These can be dissolved and washed away with the use of citric acid, as mentioned above. Zojirushi are renowned for the quality of their products, and the CV-DCC40XT is no exception. In this product they've combined great style with rugged durability and overcome the only major complaint about its predecessor, thanks to its Quick Temp setting. Whilst tea-drinkers may arguably get more benefit from having this product on their kitchen work tops, coffee drinkers, too, will benefit from the convenience of having water of exactly the required temperature readily available at the touch of a button. And once you've bought your Zojirushi CV-DCC40XT water boiler and warmer you can be pretty sure you won't have to replace it for many years. The Keurig K-Elite coffee maker is a single-serve machine that Keurig introduced to replace the K575. They wanted to modernise the style but keep the solid build. The Keurig K-Elite single serve coffee maker is a single-serve machine that Keurig introduced to replace the K575. They wanted to modernise the style but keep the solid build. A product that had little to go wrong and yet provided all the tools that a serious coffee drinker might need. And at a reasonable price. They've kept the price down by not making it Keurig 2.0 and forgoing a touch screen. Was this a wise move? And does the K-Elite prove itself to be an adequate replacement for the K575? Keurig boast that this K-Elite coffee maker has (among other things) a "striking brushed finish and metal details". With a price nearer to $150 than $100 you would expect a better build quality than some of the cheaper Keurig models, and in fairness it seems Keurig do deliver on this. Metal components instead of plastic means a more robust machine and few if any breakages. The lack of a touch screen is probably a good thing in this price range. They are all right if you are prepared to pay for them, but notorious for going wrong if they are not of top quality. This coffee maker has sturdy buttons that are easily accessible, and a digital readout. It's programmable, so you can set it to switch on in the morning, saving you a minute or two, and saving on energy consumption. But it won't brew without manual input from you. The K-Elite not being a 2.0, you can use any brand K-Cup you like, or brew your own ground coffee using the Universal My K-Cup Reusable Coffee Filter (sold separately). A charcoal water filter is included but be careful not to throw it away with the packaging as it's not all that noticeable. All in all, Keurig have concentrated on producing a quality machine that doesn't promise anything it can't deliver. Is The Design Really An Improvement? With the design, Keurig wanted something that would look at home with all the other stainless appliances in your kitchen. They've managed to keep the size compact and yet inclusive of a large 75-oz water reservoir. This is smaller than the 80-oz you get with the K575, but it does heat up more quickly. Like most modern Keurigs, it lives at the side of the machine. Keurig have made it opaque to fit in with the rest of the design, which means you can't easily see how much water is in it. But the light that comes on automatically when you power up helps offset this drawback. The Strong and Hot Water buttons sit at the top of the control panel, above the iced option and the cup size selection buttons and below the digital clock and settings buttons. There are five cup sizes to choose from, between 4 and 12 oz. 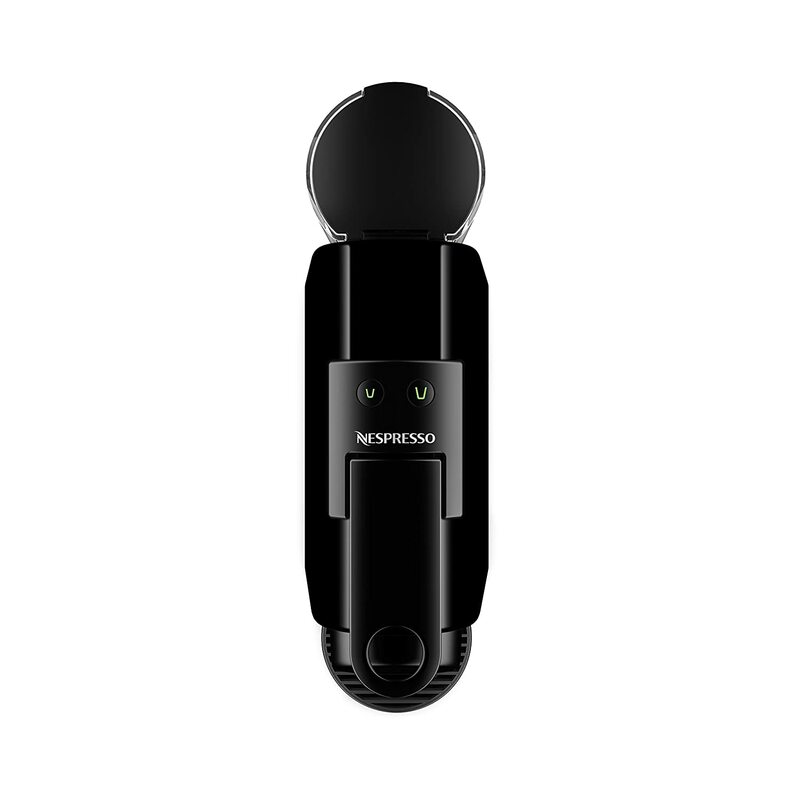 It's very easy to work, and when you lift the handle the pod holder comes out at a convenient angle to make it easy to insert or remove your pod. The Strong button is a necessity if you tend to use the larger size brews, as otherwise you may find yourself presented with weak coffee. The Hot Water button is next to it. Use it for a quick clean (see below) and if you regularly make instant oat meal, for example, or even hot tea (surely not!:). The Iced button is probably unnecessary, given that you have a Hot Water button that performs exactly the same function. So it's difficult to say if the design is an improvement or not. There may be a little overall, but everyone will have their own opinion. One thing's for sure - it's unmistakably a Keurig, and that means a pleasing yet practical design. The Keurig K-Elite is undoubtedly very easy to use. The controls are intuitive. You insert your pod, press the Strong button if you want extra strong, and press the cup size. If you just want hot water or are making iced coffee then you press the appropriate button and then the cup size. Close the lid and the machine brews your choice within around one minute - the optimal time for ensuring you get all the flavor from the pod. Cleaning is equally easy, using the Hot Water button. The drip tray is removable for cleaning (or if you wish to fill a travel mug up to 7.2 inches high). Changing the filter and descaling should be done every couple of months, depending on usage. You can read elsewhere on this site how to clean a coffee maker. Using the Settings button on the control panel, you can program this coffee maker to produce precisely the brews you like. The temperature control lets you set the brew temperature to between 187 and 192 degrees F. Most coffee lovers will prefer the higher end of that scale in order to extract the most flavor from the coffee. There's also a high-altitude brew setting in case you live up in the mountains. This allows the K-Elite to function at up to 10,000 feet above sea level. If this applies to you then it would be advisable to set the brew temperature at a lower level to start with until you are familiar with how this particular setting works. Brew Sizes: 4-oz, 6-oz, 8-oz, 10-oz and 12-oz. Additional Settings: Hot Water, Iced, Strong Brew. Auto Warnings: Clean and Descale. Programmable for temperature control, strength of brew and iced coffee. Five cup/mug sizes to choose from. Speed - brews in around 60 seconds. Auto shutoff can cause problems if not mastered properly. Water reservoir smaller than on the K575, so more refills necessary. The Keurig K-Elite is rated at an average of well over 4 stars from well over 950 reviews on Amazon at the time of writing (March 2019). Well over 80 per cent of reviewers award four or five stars. What users love best about this product is its solid build, the large water reservoir, the maximum brew size of 12-oz, and that you have a wide choice of brews to choose from when you use the Universal My K-Cup Reusable Coffee Filter (sold separately). A few reviewers have complained that the water reservoir isn't large enough for their needs, so you should check that 75-oz is going to be sufficient. The Keurig K-Elite coffee maker is ideal for domestic use where there are up to six or seven coffee drinkers. It has stylish looks that make it look at home in any modern kitchen. It can be programmed to produce your coffee in exactly the way you want it, and even has a high altitude setting. The build is sturdy and it's available in six different colors. It's hard to think of anything that a seasoned coffee drinker might need that isn't provided by the K-Elite - and in style. The Keurig K-Select Single Serve K-Cup Pod Coffee Maker, to give its full name, is a replacement model for the very successful Keurig K-250. That latter model was brought out some years ago to meet the demand for a single-serve coffeemaker with a smaller footprint. Very often such a move is fraught with danger in that many fans of the original product will make unfavorable comparisons with it when giving their views of the new coffee maker. Is that the case with the K-Select? Read the review below to find out. Ease of Use How Many Cups? I want to mention the K-Select's Strong Brew feature before anything else because it's so simple and yet so effective. A major drawback of so many coffee makers that are otherwise extremely versatile and simple to operate is that the brew they produce lacks strength. Keurig have taken note of this concern of so many coffee lovers and incorporated a simple solution. So when you feel like a stronger brew (which, if you're anything like me, is most of the time) the "Strong" button is there for the pressing, right next to the 12-oz mug size selector button. Press it prior to selecting the size. This causes the machine to slow the rate that the water flows through the pod, causing more flavor to be captured. Does this give you a great tasting mug of coffee, bold, strong and intense? It's hard to find anyone who says otherwise. The Keurig K-Select is available in six colors. It comes in at around $99 to $130 at the time of writing (March 2019), depending on which color you select. This is a good price for a single-serve pod coffee maker that has extreme ease of use combined with versatility, reliability and speed. Does the K-Select have all of these? Let's see. Is The Keurig K-Select Easy To Use? A glance at the top of this machine will give you the answer. This is not a digital machine, so there's no learning curve to speak of. Just buttons. You put your mug or cup or carafe in place, and your selected pod into the top of the machine, pressing the lid firmly down. As mentioned above, if you want a strong brew then press the button for it. Then there are four size-of-brew buttons to choose from - 6-oz, 8-oz, 10-oz, and 12-oz. Just press the appropriate button. And that's about it. You'll have your brew ready in around 60-seconds. If you want a different brew, such as hot chocolate or iced coffee, there's no problem. The scanner identifies the contents of the pod and brews accordingly. And if you have a tall travel mug (up to 7.4 inches tall) then you can remove the base plate to make room for it. How Many Cups Before You Need A Refill? One thing about the Keurig K-Select that has bothered some users is the size of the water reservoir. Keurig claim that you can brew five cups before you need to refill, but some have questioned this, saying it's nearer to four. It depends, of course, on how large your mugs are and what size of brew you normally select. But the fact is that the reservoir can contain up to 52 oz of water, which should be enough to satisfy up to at least four people regularly using the machine. Even if you can't use all 52 oz before getting the refill signal (this is usual for coffee makers). It's not as if refilling was difficult, though. Keurig have made it as easy as it can be. Lifting and replacing the reservoir is very easy, and you can use a jug to refill if you dislike removing it. Some users say that the reservoir should be larger, but bear in mind that Keurig have made a quality machine at an affordable price and with the specific intent of catering for customers whose worktop space is at a premium. A larger reservoir would inevitably increase the footprint and make the machine inappropriate for many customers. If you need a larger reservoir you would be better off with the Keurig K475. If you've read some of the reviews of the K-Select then you'll probably have some concerns about how it often needs turning on before each brew. Some users have had trouble with this, including where their machine misbehaves on switch-on, for example by ejecting water prematurely. All this is almost certainly down to a misunderstanding of the auto shut-off facility. This is set to "on" by default, and means the machine will automatically shut off after 2 hours of non-use. This is to save on power consumption where users forget to switch off for the day or before leaving their K-Select for a prolonged period of time. But it is easy to disable this feature. The User Manual, near the foot of page 2, tells you exactly how to do this. If you haven't been supplied with a printed version with your K-Select then you can download a PDF version from the Amazon description page or from Keurig's web site. Is Cleaning It As Easy As Using It? As with any coffee maker, it's important to keep the Keurig K-Select clean, but at the same time to be careful simply because complex electronic products and water have an uneasy relationship. With the exterior, drip tray and reservoir this is easy. You can hand wash the latter two or put them in a dishwasher, and the exterior just needs an occasional wipe down with a clean cloth. Make sure you thoroughly rinse the reservoir of any soapy water for obvious reasons. Some users have experienced problems with water spilling out onto the work surface or coffee grounds appearing in their mug. This is caused by clogging of the entrance and exit needles (through which the water pours through the pod and then into your mug or carafe) with sediment from previous brews. These items need cleaning at regular intervals by flushing through with a wash cycle. Like other coffee makers, the K-Select needs descaling every 3 - 6 months, and the built-in Brewer Maintenance Reminder issues an alert when that time is due. Read more about how to clean a coffee maker by clicking this link. As at March 2019 the Keurig K-Select scores almost 4 stars from nearly 900 reviews on Amazon. Nearly three quarters of all reviewers award either four or five stars. It scores over 4 out of 5 from over 470 reviewers on Keurig's site. Many reviewers love how easy this machine is to use and to clean. Others like the "Strong" option, and the great tasting coffee they can enjoy. The speed and the choice of brew size are also well received. A high noise level and questionable build quality are mentioned by some reviewers, but most seem satisfied that the K-Select is quiet enough, bearing in mind that it is a coffee maker and not a steam iron, and are happy with the quality of the product. For no more than around $130 you're getting a high quality single-serve coffee maker that has a large number of satisfied users. 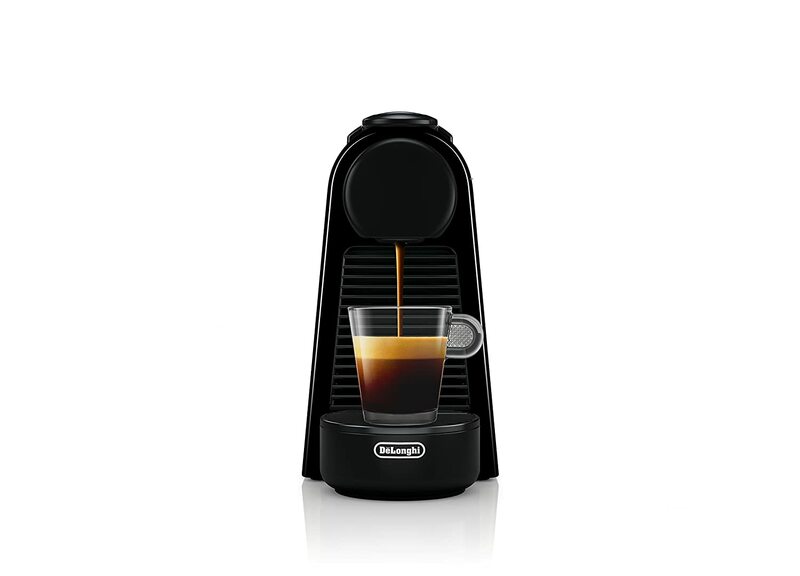 It's ideal for homes where there are up to four coffee drinkers liable to need their coffee at the same time. It's even more ideal where strong coffee is popular. As long as care is taken in regular maintenance and cleaning then there's no reason why the Keurig K-Select coffee maker shouldn't satisfy all your domestic coffee making needs for many years. The Haier 12-Cup Coffee Maker is unique. There are no other coffee brewers anywhere like it. What makes it unique? Well, before we get into the down and dirty, let me tell you this. When it was introduced into the marketplace the first 30 plus reviews of it on Amazon.com all gave it the full five stars. I doubt there are any other coffee makers, and probably any other kitchen appliances of any kind, that can boast that. So let's take a look at its other unique characteristics. Note: The Haier 12-Cup Coffee Maker has now been discontinued. You may still have cause to read about it, which is why this review has been left in place. What's So Different About The Haier 12-Cup Coffee Maker? Where's best to start? Maybe with the way it looks when you set it up on your kitchen worktop. It has a sleek, attractive design, with a blue lit LCD display prominent on the Control Panel, above the buttons. This shows the time, and also displays the settings you've selected. The buttons themselves, on the stainless steel facade, are large and encircled by rings that light up blue when activated. They are matched by the water reservoir to the right, which is illuminated in blue when the machine is brewing. And the water level indicator also lights up in blue for easy reading. You don't come across that very often, even in machines costing several times the price. Below the Control Panel sits the glass carafe, which is included in the price. This has markings to show cup levels and holds 1.8 liters, enough for about twelve cups, or six large mugs. It sits on a hot plate, about which more below. The space in which the carafe goes is neatly designed so as to minimize heat loss. All this helps ensure that your coffee is not only piping hot immediately after brewing, but stays hot for longer. Lifting the top of the coffee maker reveals the permanent filter, easily removed for rinsing clean. Not unique, perhaps, but still a welcome money-saving feature. Also removable is the filter basket, which is double-walled so as to better retain the aroma of your coffee. All of this in a unit only thirteen and a half inches tall, and less than nine inches deep and wide. That itself is one of the things that makes this coffee maker so popular with its owners. Having only five buttons, including the on/off button, the Haier 12-Cup Coffee Maker is nevertheless programmable to make life easy. Pressing the Auto button, on the far right, sets it to brew a full carafe. This will take no more than about 10 minutes. If you want less, then press the 1-4 Cup button instead. Five beeps indicate that the brew is complete, and the machine then switches mode to heat the carafe. This it will do for up to two hours, before switching off. Well, who wants coffee that's been brewed more than two hours? What if you want your hot coffee waiting for you when you awake in the morning? That's easy. Just press the Pgm button and follow the intuitive on-screen instructions. You can program in this way for up to 24 hours in advance. And you can always interrupt the brewing process if you just can't wait any longer for your coffee. The "pause and pour" option lets you remove the carafe mid-brew to fill your cup. The coffee stops pouring so there's no mess to clear up, and resumes when you replace the carafe. At the present time, the Haier 12-Cup Coffee Maker is well below the $70 mark on Amazon. It is not only a programmable, automatic machine that can produce from one to twelve cups very quickly. It also produces fine tasting coffee in no more than 10 minutes for 12 cups. Included in the whole package are the glass carafe and the permanent filter, as well as a useful measuring spoon. So, value for money? I'd say it scores very heavily on this. To say the Haier 12-Cup Digital Thermal Coffee Maker is popular with its users is an understatement. I've already mentioned its early 100 per cent five star ratings. Currently, it's average score is over 4.5 from over 80 reviewers. Among the most popular features is the simple set-up. Apart from setting the time on the clock, all you really have to do is to give it a clean. You don't even really have to know how to use a coffee maker. The speed of brew and the stylish looks are also well appreciated. The only real complaint from users relates to the size of the opening into which you pour your water prior to brewing. This is rather small, and sometimes when barely awake in the early morning you may find this a little tricky. However, most users don't seem to have much of a problem here. The Haier 12-Cup Coffee Maker is sturdily built of quality materials and should last for many years with average use. It's extremely simple to use, and versatile enough for almost any home situation, from one person to a large family. There's hardly anything not to like (including the price). It looks great on any kitchen worktop, and its black plastic and stainless steel exterior will blend with your existing decor. Overall, this is a lovely coffee brewer and we are sure you will not be disappointed in your purchase. The Keurig K145 OfficePRO Brewing System, as the name implies, is a commercial coffee maker intended for use in an office environment. You can only purchase either direct from Keurig or from an authorized distributor such as Amazon. Yet plainly many people opt to have this as their domestic coffee maker. There must be a reason, or maybe several reasons. Let's take a close look at the K145 and find out why, and if this confidence is justified. Note: The K145 has now been discontinued, as of February 2019. You may still have cause to read about it, which is why this review has been left in place. What You Get For Your Money Why Some Heavy-Duty? The Keurig K145 OfficePRO is a single serve machine, brewing one cup at a time. You have three sizes to choose from - 6, 8, and 10-oz. You make your selection by way of a chunky knob that sits on the top, rather than the traditional push-buttons. It's designed to be switched on at the start of the working day and off at the end. If no-one switches it off then, as long as the auto-off feature has been activated, it switches itself off after two hours of non-use. Being always on, it brews your cup of coffee in less than a minute. You can choose what you want from over 500 varieties of tea, hot cocoa, or an iced beverage. Anything that is covered by the K-Cup system, and that includes 75 well-known brands. And since this machine is not part of the Keurig 2.0 technology, you're not restricted to 2.0 pods. You also have a 48-oz water reservoir with a removable lid, and that is itself easily removed. So re-filling, or just topping up, is easy. You can remove the drip tray when you want to fill a travel mug that otherwise would be too tall for the machine. And you can dispense hot water, eg for a cup of tea, by pressing the brew button without inserting a K-Cup. Finally - and if you're new to Keurig coffee makers this will be very helpful - you get a bonus. A variety pack of 12 K-Cup pods. Why Are Some Of The Components Of The K145 Heavy Duty? The Keurig K145 OfficePRO has a water tank that holds enough for four or five cups. Its typical use is meant to be in an office of up to 15 people. It is going to be in regular use throughout the day, day after day. So if there are any weaknesses they are going to show up quickly. A common weakness of coffee makers is the pump. If this gives out, the machine has to be scrapped. For that reason, Keurig have given this machine a heavy-duty pump system. This is what their home models used to have before they introduced "Quiet Brew Technology". The power cord is also heavy duty. This machine often operates in an environment where several other high-powered machines are powered on the same circuit. Possibly it's overkill, but better safe than sorry, especially where electricity is concerned. If It's A Commercial Brewer, Why Do So Many People Use It At Home? Good question. It may be helpful here to look at another very popular Keurig coffee maker - the Keurig K45. You can read our review of this machine by clicking here (opens in a new tab). As you can see, the K45 is very similar to the K145. It has the same size of water reservoir, and the same auto-off feature (with the same 2-hour period). 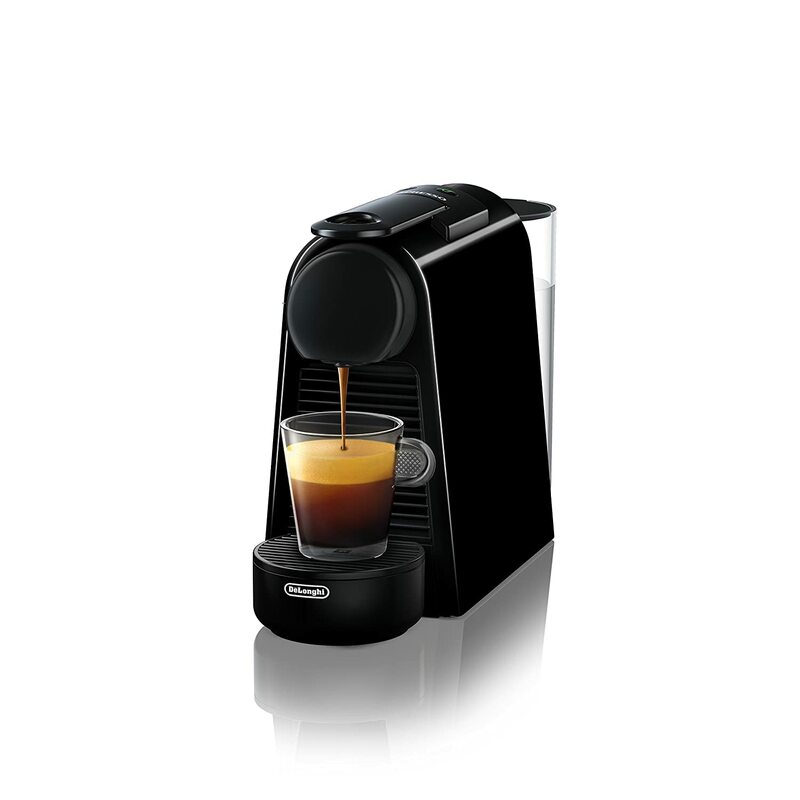 It has the same sizes of brew and is equally fast, brewing in 30 to 60-seconds when switched on. And the drip-tray makes way for a travel mug when you want. But the Keurig K145 OfficePRO has more. And I'm not just talking about the heavy duty components and the chrome and silver trim. It has a brew/drain switch at the rear, and a drain button which expels all the water from the inner tank. You don't even have to move the machine. Very useful if you want to pack up for removal or storage. Heavy duty, though, is often the clincher. The K45 has a quieter pump that lacks the strength and toughness of that in the K145. With the prices being not that dissimilar, it's no wonder that many coffee lovers have opted for the K145. The price of a tougher, longer-lasting pump may be a little more noise, but it's a price many people feel is worth paying. There aren't any decent videos available on YouTube at the present time that give any more information on the Keurig K145 OfficePRO. I'll check periodically and when I find one I'll upload it here. Most popular among reviewers of the Keurig K145 OfficePRO is the huge choice of brands and flavors of K-Cups available. If you use filtered water then cleaning is, for the most part, very easy. A warning light shows when you should clean with a de-scaler. It helps to clean a coffee maker with vinegar every six months or so, as well. There's much to be said for a coffee maker that brews your coffee in a minute, with little preparation required. And that can brew a variety of different drinks without the taste of the previous brew migrating into your own. Some users have commented that if you use the 10-oz cup size the coffee is weaker. The answer seems to be to use a dark roast, which will give you a fuller flavor. Others don't like the level of noise produced by the pump (though most users have no problem with this). I've covered this earlier, but here's a tip. If you find the noise tiresome, place your machine on a folded towel or half inch thick sheet of foam. That should reduce the sound level by more than half. The K145 enjoys an average rating on Amazon of well over 4 at the present time, from over 870 reviewers. Nearly four fifths give 4 or 5 stars. The Keurig K145 OfficePRO is a heavy duty coffee maker that is fast and easy to use. It's built to be strong enough to cater for a small office of fifteen or so people. Its pump, the Achilles Heel of many coffee makers, is of industrial strength. The quality and variety of brews it can produce is undeniable. It's backed by a one-year warranty and Keurig's well-known customer care. It is probably advisable to purchase, if not from Keurig direct, from an authorized distributor (such as Amazon). This is to ensure you get everything you're paying for. So if you like what you see, then go ahead and purchase this model from the link below. This Keurig K250 coffee maker, part of Keurig's 2.0 Technology, was their response to consumer requests for a smaller footprint. Keurig wanted to produce a powerful yet affordable appliance with a large water tank. It also had to have a wide range of options as to size and type of brew. And, of course, the legendary technological superiority and push-button friendliness of all Keurig 2.0 coffee makers. Note: The Keurig K250 has now been discontinued. You may still be able to purchase it, but new K250s are now rare. Used K250s are available, which is why this review has been left in place. The K250 has been replaced by the Keurig K-Select Single Serve K-Cup Pod Coffee Maker. If you would like, then please click here to read our review of the Keurig K-Select Coffee Maker. Have they managed to put all this plus the desired smaller footprint into the K250? What You Get Do K-Cup Pods Restrict Choice? Quite a lot actually. The Keurig K250 is essentially the same as the K200, but with a cleaning kit included. It also has with it 4 K-Cup pods and a water filter handle with two filters. I'll cover the touch screen control panel in a moment, but I want to mention the settings. These are intuitive, and the process of making your selections is very easy. And there's even a high-altitude setting, in case you're living up in the mountains. The 40-oz water tank wraps neatly around the rear of the machine and is easily removed for replenishing. The unique design of it enables you to keep the K250 in places that you couldn't put anything else. The result is a sleek-looking device, slim and pleasing to the eye. Especially when combined with some of the eight colors to choose from, including Turquoise and Imperial Red. Oh, and there's enough space in the tank for four or more cups before having to refill. The length of the power cord, at 18 inches, is a trifle excessive, and it doesn't retract either. Something to consider if you have limited space on your kitchen counter. Don't K-Cup Pods Restrict Your Choice? This concern came to the fore again when Keurig introduced smart pods in their 2.0 series. The compatible pods are read by the machine so as to produce exactly the right kind of brewing process for the strength and flavor of the grounds inside. I won't say this concern is groundless, but the fact is that the Keurig 2.0 K250 System is compatible with over 500 brands and varieties of K-Cup pods. Most of us will find such a choice not only adequate, but positively overwhelming. It also takes Keurig's recyclable K-Cup pods and its 2.0 My K-Cup refillable accessory (which you have to purchase separately). So you can use your own grounds if you can't find any K-Cup pods you like. Unfortunately you're restricted to cups here. There's no reusable filter available for carafes. Framed by the familiar Keurig handle, the digital display is a touch screen that displays all the options available. It's not color, and it's only two inches square, but it gives you all the information and control you need. The Keurig K250 accepts four different K-Cup pod sizes, from 4 to 10-oz. If you've also bought a carafe for the K250 then you have a further choice of three K-Carafe pod sizes. The Keurig 2.0 Thermal Carafe fits into the K250 very neatly. Just remove the drip tray and you'll find the knob below the spout connects to the back of the machine. There's a further option. In the past Keurig have faced some criticism on account of the difficulty in producing a strong cup of coffee. That particular issue has now been laid to rest with the help of the Strength Control setting. This is in the bottom left of the opening screen and works with any K-Cup or K-Carafe brew size. It slows the whole brew process a little to extract more flavor. Once you've scrolled up and down and made your selections, you simply press the big Keurig button below the touch screen to start the brew process. This takes no more than a minute to 90 seconds. Your chosen brew, of the correct strength and amount, is then dispensed direct into your cup or carafe. Any time you prefer a cup of tea you can simply dispense hot water only. Just select the brew size, and open and close the distinctive brewer handle, ensuring there's no pod inserted. You can also make iced coffee. Just fill a 12- or 14-oz cup with ice chunks and choose the 6- or 8-oz cup size. Best to avoid glass containers here, of course. And you can remove the drip tray to accommodate a travel mug of up to seven inches in height. I nearly always have a separate section on this as it's so important. If you neglect to clean your coffee maker you're opening yourself to the risk of faults developing in your machine. Not to mention a deterioration in the taste of your brews. Most of the mess will be in the filter which you will discard. If you're using a reusable filter then rinse this through regularly. The drip tray unclips easily for cleaning, and the rest of the machine just needs an occasional wipe down. You should replace the water filter every two months, or after around 60 tank refills. If you find your K250 is beginning to smell then wash the offending parts with warm water and a small amount of white vinegar. This will have the machine looking and smelling like new again. It's very seldom that I review a product that has fewer than 4 stars as its average score on Amazon. This product is no exception, with a score exceeding that amount from over 570 reviews at the time of writing. The more in-depth reviews praise the quietness of the machine and the speed at which it works. Most reviewers also love how they can brew any amount from 4-oz all the way up to 30-oz. And the way it reminds you to change the water filter is popular too. Some criticisms have included how there's no on/off switch and no auto-off. You can actually switch the machine off by pressing the big Keurig button (though this isn't made very clear). Some users consider it essential to use the permanent filter, but this has to be bought separately. Overall, satisfaction with the Keurig K250 is high, and nearly three quarters of reviewers give it four or five stars. If you live alone or with one other person, with limited kitchen space, and have occasional visitors, then this coffee maker is ideal. It's true that you're limited to K-Cup pods, but, even so, you have an extensive choice of brews. And you can use your own grounds if you have the My K-Cup refillable accessory. The Keurig K250 is one of the top Keurig coffee makers and we can recommend this product to you with great confidence. The SharkNinja Coffee Bar CF091 gleams in no-nonsense black and stainless steel, with its water tank glass emphasizing the look. This business-like coffee maker is designed for an environment where coffee tastes vary and sometimes demand is heavy. Where its "Advanced Thermal Flavor Extraction Technology and Auto-iQ One-Touch Intelligence" can be best used. Which SharkNinja Coffee Bar To Choose? SharkNinja actually have five main products in this range - besides the CF091 there is the CF092, CF097, CF111 and CF112. They are the same machine as far as brewing and frothing are concerned. The main differences are in the choice of brew sizes. The CF091, CF092, and CF097 give you a choice of six brew sizes. The CF111 and CF112 give you a choice of only four - the half and full carafe sizes are omitted as there is no carafe supplied with them. They all have a built-in frother, but they do all vary in what else is included in the package. And the price, of course, varies as well. Amazon has easy links to all the various products in the range. Here I'm not talking about a choice of pods, because the SharkNinja Coffee Bar coffee maker doesn't use them. That brings the running costs down a bit. Mind you, it doesn't grind your beans either, so if you grind your own then you'll need to keep your burr grinder. What it does do, first off, is offer you a choice of single serve or carafe. You can have any one of six brew sizes (four in the case of the CF111 and CF112, which have no carafe), from cup to full carafe. Selection is by way of the easy-to-turn knob at the top of the control panel. The Coffee Bar doesn't do espressos, but it does cover virtually every other coffee drink you can name. You can even make tea with it. But it's how to make good coffee that we're really interested in, isn't it? And we have five main routes to follow. The Classic Brew is a rather basic cup of coffee. Delicious for sure, but maybe a little bland? In that case, consider next the Rich Brew. This is stronger and ideal for when you want to add milk, cream or flavoring without diluting the taste. Feeling hot and sticky in the summer heat? Then try the Over Ice Brew. This is more concentrated. It has to be to keep the flavor in a mugful of melted ice. Best to fill your mug with ice to the top to get a proper sized brew. It just has to be my favorite, for sure. Next up is the Specialty, or Concentrated Brew. It's for blended coffees, whether ice blended or milk frothed. It gives you 4-oz of concentrated brew for blending into flat whites, lattes, mochas or cappuccinos. Want a double shot of it? I know I would. Just press the Cafe Forte button instead for a full 8-oz. Just what is "advanced thermal flavor extraction"? And what is "Auto iQ One-Touch Intelligence", come to that? Taking the second phrase first, it means that, having selected your size of brew, you only need to touch the buttons once. That's to select the exact kind of brew that you want from the options I've mentioned. There's one thing I want to mention here. Once you've made your selection the Coffee Bar swings into action and there's no going back. It calculates and delivers the correct amount of water, and assumes that it's all available. So always monitor the water level to avoid running out of water before the end of the brewing cycle. The "advanced thermal flavor extraction" means that the machine ensures that all the flavor is extracted from the coffee grounds. Other machines might simply drown the coffee grounds in hot water and allow it to filter through into the cup or carafe. The trouble here is that often the process is over before all the flavor is extracted. The SharkNinja Coffee Bar does it differently. There are twelve evenly-spaced holes, in a circular pattern, above the filter basket where you place the grounds. These are where the water comes through. The machine, knowing how much grounds there are, allows just enough hot water to drip through to saturate them fully. It then leaves things for around 15 seconds (depending on the size of brew) to allow pre-infusion to take place. All the flavor is loosened and made ready for release. Only then is the rest of the water dripped over the grounds to filter through. The result is a delicious cup or carafe of coffee, according to your selection. And if it's taken "advanced thermal flavor extraction" to produce it then I for one won't be complaining. The milk frother folds away neatly at the left rear of the Coffee Bar when not being used. When you need it you swing it round to the side, where there's plenty of room for your mug or carafe. It has a unique attachment that whisks and froths your milk, and easily detaches with a twist for rinsing clean. You can froth anything with this. At least, anything that's capable of being frothed, including almond- and cashew-milk. You do have to heat your milk in the microwave first, though, for around 30 seconds per cup, as the Coffee Bar doesn't do it for you. That aspect has attracted some adverse comment from users, but it's not that much of an inconvenience. And just think how much you've saved by not having a milk heater. The short answer is yes. The machine itself notifies you when it needs cleaning. Using a proper cleansing agent, just press the Clean button on the control panel to start the process. You should run two cleaning cycles before using the Coffee Bar for the first time. Just follow the cleaning instructions in the User Manual. The milk frother will need regular cleaning, of course, and you can easily detach and re-attach it. The water reservoir and lid come out easily for washing in the dishwasher. And the permanent filter has a natty little handle you use to remove it for rinsing. SharkNinja leave nothing to chance with their Coffee Bar. On top of the range of brews and brew sizes there's the question of filters. Some of us prefer a paper filter, even though we have to replace them after each brew. You can easily replace the permanent filter with a paper filter. There's a built-in swing-down platform to accommodate smaller cups and mugs. This helps cut down on splashes, and hence cleaning. Nice touch. You also have a double-ended scoop for measuring your grounds, that stores away neatly on the side. The drip-stop lever is something you don't see on most other coffee makers. You'll find this on the water outlet, and you slide it along to cut off the flow of water. You may be brewing a full carafe, and want a quick mug for yourself. Don't forget to re-slide it back afterward, to resume the carafe's cycle. If you do forget, there's a warning light and a friendly "beep" after a few seconds. SharkNinja haven't neglected to make full use of the digital clock, now situated on the "floor" of the machine. Through it, you can program your brewing cycles, and set up a delayed start. The SharkNinja Coffee Bar has an average score of nearly 4 from over 1,250 Amazon reviewers at the time or writing (February 2019). Nearly three in every five of them have awarded the full five stars. Particularly popular are the foaming arm and the drip stop. Most users love the iced coffee facility. They also appreciate the speed of the machine, the variety of brew sizes, the perfect temperature of the coffee, the ease of cleaning, and choice of richness level. Many users are former Keurig fans, and especially like the fresher flavor that the grounds produce, as opposed to K-Cups. Not to mention not having to buy K-Cups or Nespresso pods any more! Less popular are the need to heat your milk in the microwave before frothing. Some have found that on their machine a "full" pot is a couple of inches shy of the top. Most users, however, don't seem to have this problem, or deem it unimportant. Overall, this coffee maker is a huge hit. The SharkNinja Coffee Bar is a proven appliance with thousands of very happy users. With just a few presses of the buttons on the control panel you can choose which brew you want, and the size of it. And when you want it ready for. The milk frother is a pleasure to use, and cleaning the machine and all its component parts is easy. All the hard work is done for you. And as for the Over Ice Brew, well what more can I say? Only that you can purchase the SharkNinja Coffee Bar with full confidence that you'll enjoy some of the finest coffee from it that you've ever tasted. Much of what I could say about the Keurig K475 I've already said about its big brother, the Keurig K575. (Click here to see my review of the K575). They both use Keurig 2.0 technology, so they "read" the lid of each K-Cup or K-Carafe pod so as to optimize the brew. They both have color touch screen control panels and large water reservoirs, though those on the K475 are smaller. The coffee maker comes with six K-Cup pods and a water filter handle, together with two filters. You'd think that a carafe would also be included, as this machine is designed to take carafes as well as cups. Perhaps that would push the price up too high for Keurig's liking. Keurig emphasize the versatility of this coffee maker, and it's difficult to fault them on that point. You have five brew sizes for cups (4, 6, 8, 10, and 12-oz), and three for mugs (12, 14 and 16-oz). And for the carafe that you have to buy separately, you have 22, 26 and 30-oz. There have been criticisms of Keurig coffee makers in the past for producing brews that aren't strong enough. The Strength Control Setting is designed to overcome that. It allows you to opt for a bolder cup, using any K-Cup pod brew size. Like the K575, it's fast. A brew takes no more than a minute from start to finish. And it's programmable, so you can make it turn on and off at pre-set times, to conserve energy. One criticism Keurig hope to lay to rest with this model is that their brews are sometimes not hot enough. The K475 gives you five temperature settings to choose from. Experiment until you have found the size and settings that suit your palate. there's no 18-oz brew size for mugs on the K475 compared to the K575. The Keurig K475 scores an average of nearly 4 stars from over 1,300 reviews on Amazon at the time or writing (February 2019). Nearly two-thirds of reviewers give it four or five stars. As you'd expect with a technological product like this, there are a few dissatisfied reviewers. However, most complaints are comparatively minor. These include excessive noise while brewing, and having to purchase the carafe and reusable filters separately (fair comment). Most reviewers love the great tasting coffee this machine produces and the fact that you can use your own grinds, thanks to the reusable filter. A noticeable thread here is the importance of reading and acting on the advice in the instruction manual. This includes cleaning the machine before using it for the first time, and regularly after that. If you have trouble brewing from the older K-Cup pods or from non-Keurig pods, re-inserting usually works. The K475 is basically an economy version of the K575. It costs around $30 less (depending on where you purchase it). The touch screen and water reservoir are a little smaller and you have one less size option for your K-Mug pods. However, performance, speed, convenience and the taste of your coffee (or other beverage) seems to be just as good. The Keurig K475 is a quality coffee maker and you can purchase it with confidence. One thing immediately catches your eye about the Keurig K575 Single Serve Programmable K-Cup Coffee Maker. It's the impressive 2.8 inch Extra Large color touch screen. 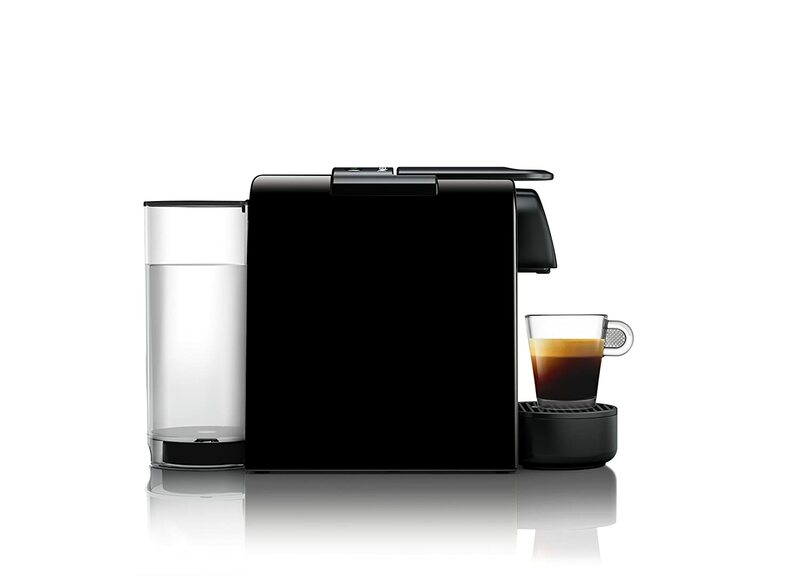 It promises ease, versatility and sheer style as the "ultimate" coffeemaker in the Keurig range. Note: This product has now been replaced by the K-Elite, but is still available online as a new item, which is why this review has been left in place. A review of the K-Elite can be found here. But wait a minute. This touch screen may boast its own wallpaper and special lighting effects. But does it help this coffeemaker justify its price tag of just about sub-$200 and produce the goods? Especially when you can get the Keurig K475, which has nearly as big a water reservoir and only a slightly smaller screen, for around $30 less. Let's see. Touch screens are spreading. They've been around for a while on our phones and tablets. Now they're on our coffee makers too. And no doubt they'll be on nearly everything very soon. Just like digital readouts when they first appeared in the late 1970s. The touch screen on the K575 is the control panel - replacing old fashioned buttons and giving you the latest state of play at the same time. By default, it displays a digital clock. But when you're using this piece of advanced technology it gives you all the other information you need as well. And in style. It's kind of hypnotic. You'll want to go through the set-up process all over again just to enjoy the lights. Then you'll want to re-program the on-off times for your new machine. Ah - if only communicating with ordinary, dull fellow humans was as exciting! But it's time, I'm afraid, to get down and dirty, and see whether this futuristic, almost intimidating, machine can let you produce, with ease, a great tasting cup of coffee (or tea, or cocoa). That's because the touch screen gives you such a feeling of power. You even have a choice of language - English, French or Spanish. Then - what's this? An altitude setting! Useful if you're living at an altitude of 5,000 feet. Next is the water filter reminder - talk about set and forget. Talking about setting and forgetting, don't forget to set the water reservoir light/night light color. Equally important - the wallpaper to give a pleasing background to your LCD screen. Oh, and while you're at it, you may as well set the Energy Saver Mode On/Off times and water temperature settings. What else is there? Oh, of course. Better set the clock so it displays the right time. Phew! I think that's about it. Only one other thing to remember when setting up, and it doesn't concern the touch screen (unfortunately). And that's to run a whole reservoir of water through it before using for the first time. Make it two things. Read the manual as well. 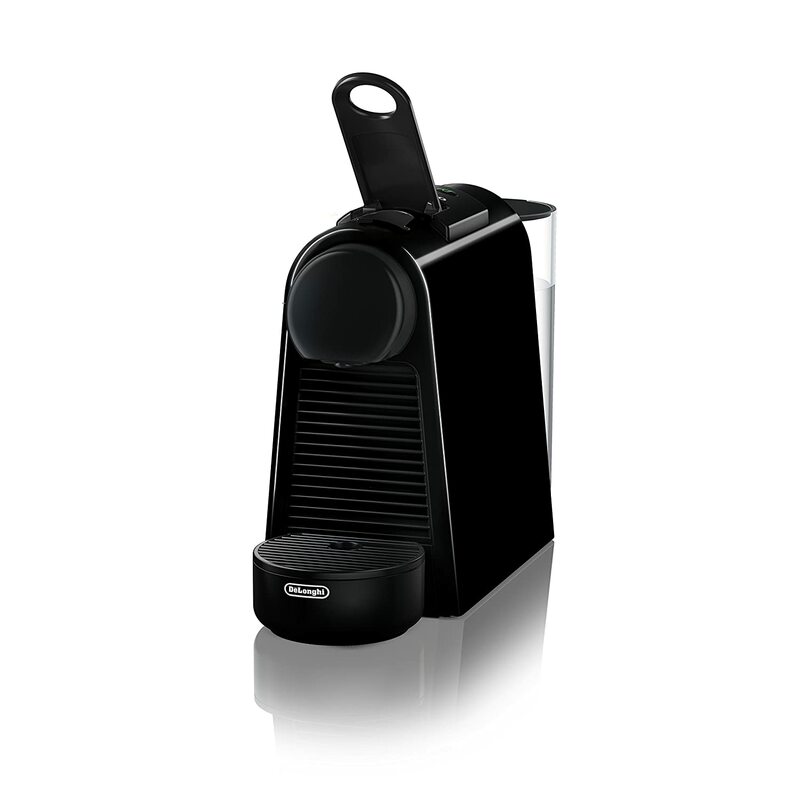 At 80-oz, the water reservoir on the Keurig K575 is the largest in the Keurig range. You can brew ten or more cups before needing to refill. That's convenient if you hate the mundane tasks associated with making great coffee and hot drinks. Like refilling the reservoir. You can remove it for refilling or cleaning, and the lid can be removed or just opened a little. But perhaps more impressive is the sheer choice you have. Not only do you have the range of coffee, tea, cocoa and specialty beverages from 75 different brands. You can also use the Keurig Plus Series My K-Cup Reusable Coffee Filter (available separately) when you prefer brewing from your own coffee grounds. More choice coming up. You can choose from a cup, with brew sizes of 4, 6, 8, 10 and 12-oz. You can have a mug with a brew size of 12, 14, 16 or 18 oz. Or if you really want to push the boat out you can have a carafe of 22, 26 or a massive 30-oz. It's a pity Keurig don't include the carafe in the package, but then that would probably push the price up above $200. So much for size. What about strength of brew? Back to the touch screen again (any excuse! ).You have a Strength Control setting that lets you brew a bolder cup, using any K-Cup pod brew size. As for the temperature of your drink, you have no less than five settings, plus a Hot Water On Demand button (choose the brew size for the amount required). That's for if you simply want to make your own drink for a change. But then, who'd want to, when you have a machine like this to do it for you? For current pricing information on Amazon, follow this link. The Keurig K575 Single Serve Programmable K-Cup Coffee Maker has almost 2,300 reviews on Amazon.com at the time of writing (February 2019). It has an average score of around 4 stars. Almost two-thirds of reviewers give 4 or 5 stars. Reviewers particularly like the ease of use and wide range of brew sizes, flavors, and temperatures to choose from. The bold coffee option scores highly, as you would expect. Also popular is the ease of operation and (needless to say) that intuitive touch screen. The new-style reusable K-Cups are a hit. Some reviewers complain that the K575 doesn't accept non-Keurig branded K-Cup pods. However, here's a secret. Search YouTube for "using the K575 with non-Keurig k-cups" (or similar search term) to find how to get round this. One important lesson from some reviewers is this. Make sure you purchase either from Amazon itself or from an independent seller with a high feedback score. Some unfortunate buyers have been supplied with an obviously used machine that is sub-standard and not even packaged properly. a state of the art touch screen display! You know (or can find out) how to use non-Keurig branded K-Cups with it, so increasing your choice of brew exponentially. And most agree the coffee tastes great. We have no hesitation in recommending the Keurig K575.